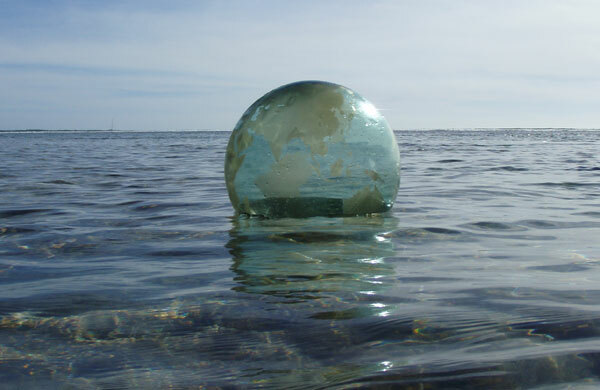 The importance of the oceans of our world. In 1947 Thor Heyerdal and crew sailed from Peru to the island of Raroia in the Tuamotu Islands in a Balsa Raft. Covering 4,300 miles in 101 days he writes, "On this ocean, where I encountered few signs of life, the traces of my fellow man were none-the-less very much in evidence. Pollution was visible everywhere. Plastic bags, Styrofoam, packing etc. We seem to believe the ocean is endless, but we use it like a sewer". 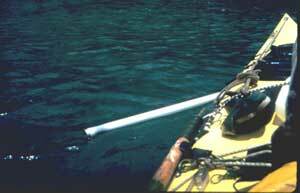 In 1991 Gerald D/Aboville rowed across the Pacific Ocean from Japan to Washington State. He writes, "Every twenty minutes or so I would come upon some sort of debris, which, considering my limited horizon, suggests the magnitude of the problem. In 1989 I crewed on a sailboat from the Philippines north along the coast of Japan. Several hundred miles from anywhere we sailed through miles of driftnets. It was estimated that over 40,000 miles of drift net were being laid each and every day in the North Pacific, enough net to stretch from San Francisco to Tokyo 6-8 times. On another voyage in 1993 from Maui to Seattle, 1000 miles from the West Coast we sailed for three hours through nothing but plastic. 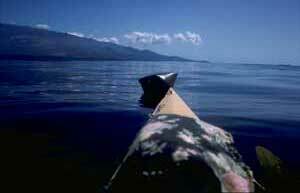 Over 30 years of circumnavigating the Hawaiian Islands by Ocean Kayak man has left his footprints everywhere. I often wonder what a migrating species such as the North Pacific Humpback whale encounters on their long open ocean migrations. From noise pollution, drift nets to lots of shipping. The oceans are the world's largest echo chamber, where sound travels 5 times further than in our atmosphere. In 1999 it was estimated that over 700 ships depart and enter Tokyo Wan each and every day. The North Pacific Humpback whale migrates annually from the Bering Sea & Alaskan waters to the Hawaiian Archipelago to mate and give birth. Engine noise blocks their most important sense of sound. This particular calf wasn't fast enough to get out of the way. 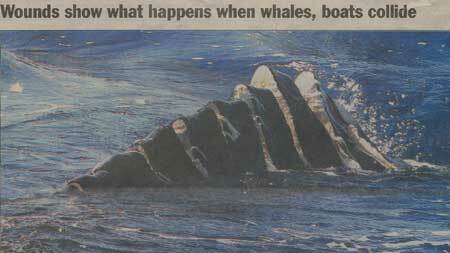 A newborn calf hit by fast moving boat, Lahaina Maui 2005. The Southern Albatross and the Polar Bear are two species that probably live farther away from human beings that any other species. However they too are found with toxins within their systems. The Northern Right Whale population in the North Atlantic is not doing well. They are reported to look healthy and feeding, however they are not reproducing. It is believed that the food they are eating is contaminated. Stands to reason, as the Northern Hemisphere is the industrial portion of the world, lots of run off. Using several models that project habitat changes, migration capabilities of various species, and related extinctions in 25 "hotspots," scientists predict that a quarter of the world's plant and vertebrate animal species would face extinction by 2050. Our oceans need more than just protection it needs direct human help. All too many species survive by our consent alone. For better or worse we have become the keepers of this planet, and our world's oceans.